California State Park Rangers removed a dead whale from Torrey Pines State Beach Thursday afternoon. 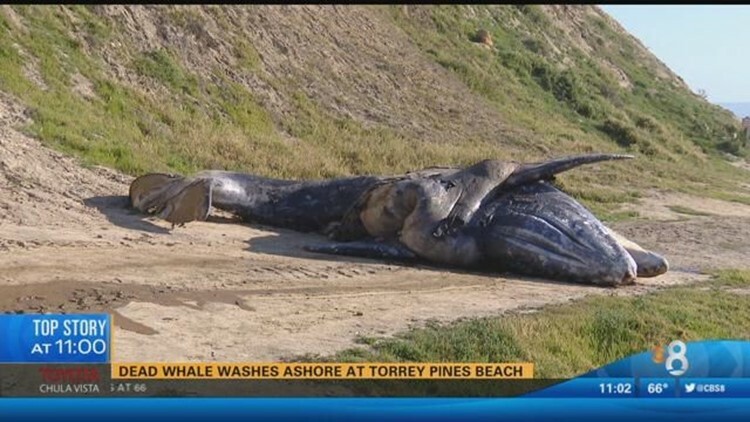 SAN DIEGO (CBS 8) - California State Park Rangers are working Friday morning to remove the young gray whale that washed ashore in Torrey Pines. Crews removed a dead whale from Torrey Pines State Beach Thursday afternoon. The whale's body was discovered by a park visitor around 6:30 a.m. about 200 yards north of Flat Rock Beach. A necropsy performed by National Oceanic and Atmospheric Administration officials was unable to determine the exact cause of death, however, they suspect the whale may have been struck by a boat. NOAA officials identified the whale as a 25-foot-long, 1-year-old gray whale. The whale was removed from the beach by park rangers and a disposal company will transport the carcass to a local landfill Friday. The San Diego Natural History Museum says they will recover the skeletal remains. This is the third juvenile whale to die and wash ashore along the San Diego coast since December. Two weeks ago a 1-year-old humpback was spotted 9 miles off the coast of Point Loma and in December another young gray whale was found along Solana Beach.